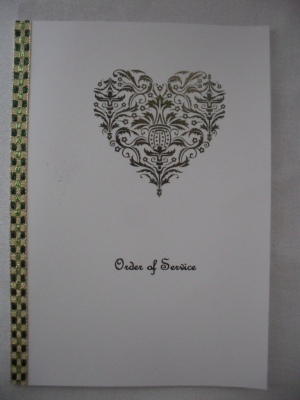 A green and gold foiled wedding order of Service card. Comes complete with all your wedding details printed inside. Bride & groom names, date & venue can be added to the front of this design. Measures approx. 21.5cm x 15.5cm. A sample is available. Other matching wedding stationery is also available.